On a daily basis across our Nation, law enforcement supervisors and senior agents are conducting roll-call briefs prior to beginning their shifts. During this time, they share sensitive information about recent crimes, trends, and dangerous or significant criminals who need to be located and apprehended. Also during this time, they share or reinforce training-related issues. On a sadder note, they communicate information concerning law enforcement officers and agents who have recently died in the line of duty. When such information is shared the room becomes respectfully quiet. Emotions and thoughts are stirred, the silence only to be broken with a question, “What do we know about the circumstances of the death?” Or, “What can we learn from this tragedy?” Chris Cosgriff, Founder and Director of the Officer Down Memorial Page once said, “When a police officer is killed, it’s not an agency that loses an officer, it’s an entire nation.” This statement embodies the emotions officers feel when hearing such news, and conveys the strands that bind each federal, state, local, and tribal law enforcement officer and agent in our country. The agency mourns along with all in our profession, for we are connected by a spirit of comradeship, pride, enthusiasm, and devotion to a cause bigger than ourselves. 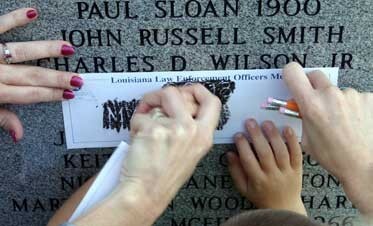 For years, the Officer Down Memorial Page, the National Law Enforcement Officers Memorial Fund (NLEOMF), and the Federal Bureau of Investigation, through its Uniform Crime Reporting Program’s Law Enforcement Officers Killed and Assaulted publication, have collected, analyzed, and reported on law enforcement officers and agents who were assaulted, killed, or died in the United States. These reports memorialize the officers and agents and help identify trends and lessons learned from such tragedies in hopes that our profession can better prepare officers and agents to be both safe and effective. Historically, law enforcement organizations have looked for trends related to criminal activity and vehicle crashes in order to identify effective measures to help reduce such occurrences. Similarly, researchers look for trends relating to causes of officer injuries and deaths while on duty. Such data analysis often results in the creation or adjustment of agency policies, standard operating procedures, and/or training objectives. Recognizing the great lessons to be learned from research, FLETC sought to examine line of duty deaths of FLETC graduates to help identify areas in which training could help mitigate tragedies. In June of 2014, staff from the FLETC Driver and Marine Division and the Training Research Office embarked on an effort to identify, analyze, and report on line of duty deaths of FLETC graduates of the Criminal Investigator Training Program, Uniformed Police Training Program, and Land Management Police Training. Through this work, FLETC has been able to identify lessons learned in order to modify and/ or supplement training activities and methodologies at FLETC. The team began by collecting FLETC graduate line of duty death data on officers and agents who were killed in the line of duty from FLETC’s inception in 1970 until the completion of calendar year 2013. During this period of time, there were a total of 199 FLETC graduates killed in the line of duty from 28 of FLETC’s more than 95 federal partner agencies. Other cause–i.e. heart attack, terrorist attack, electrocution, drowning, fall, training incident, etc. As a comparison, the team reviewed FLETC graduates’ line of duty deaths alongside a recent report from the NLEOMF for the years 2004-2014. Because FLETC’s data on its graduates only went up to 2013, the research team only used the NLEOMF’s data through 2013. The chart to the right depicts this comparison and assists in determining if there are any significant differences between the FLETC graduates and those of all United States law enforcement line of duty deaths in terms of primary cause of death. Unlike the “Other” and “Automobile” categories, which each clearly fit into a single subcategory, the deaths by gunfire often fit into multiple subcategories (i.e., undercover work while also doing drug/gun interdiction). To analyze this data, the FLETC team coded these cases with primary and secondary subcategories. Therefore, the numbers reported below include both the primary and secondary causes. Thus, the total number of incidents depicted in the chart (73) is higher than the number of gunfire-related fatalities (53). The subcategories with the most cases were drug/gun interdiction (12), traffic stops (10), and other calls for service/incidents (10). Another trend to note is that for this category, there is a more even distribution among a variety of law enforcement roles. Additionally, most of these roles are areas in which related skills are covered in law enforcement training. While many would guess that most law enforcement line of duty deaths are the result of officers being shot, this has not been the case in the United States. For 16 of the last 17 years, there have been more officers and agents who have died from vehicle-related causes than by any other means. For a more in-depth analysis, the FLETC research team placed FLETC graduates’ auto related-death data into a variety of subcategories. The most significant finding was that most deaths happened during regular, non-emergency driving. Again, most would guess that there would be more crash deaths during emergency response or pursuit driving. Interestingly, a 28-year study conducted by the National Highway Traffic Safety Administration, which analyzed the deaths of officers who died in vehicle crashes from 1980-2008, found that 58% of these deaths happened during non-emergency driving. The lesson is that improving performance during non-emergency or regular driving appears to be just as critical or important as preparing our students for emergency vehicle operations. There was a significant difference between the data for FLETC graduates and the total law enforcement population in the “Other” category. Forty six percent of FLETC graduate line of duty deaths fell into this category, compared to 21% for all law enforcement. Such a difference warranted further investigation. FLETC analyzed this data, coding it into sub-categories comparable to those NLEOMF uses. Due to the much smaller number of FLETC graduate line of duty deaths compared to those of all law enforcement, the team plotted all FLETC cases (1970-2013) against only the most recent NLEOMF data (2004-2013). The largest difference in this data revealed that more FLETC officers and agents were killed in aircraft crashes (23% versus 8%) and terrorist/bomb related incidents (21% versus 5%). After closer examination, the team determined that factors leading to deaths caused by airplane crashes and bombings are not generally within the scope of the training officers and agents attending basic training at FLETC receive. When adjusting the numbers by removing aircraft and terrorist/bombing deaths from the overall statistics, the numbers become very similar. A closer analysis of the adjusted statistics in the ‘Other’ category reveals that the largest risk for FLETC’s graduates comes from health-related issues. There were 24 FLETC graduates in this category. Of the 24 deaths, 18 were from heart attacks. There were more FLETC graduate fatalities from “Other” causes than for the larger law enforcement community. However, these differences were areas that fell outside the scope of factors that are addressed in basic law enforcement training (airplane crashes and bombings). When those two subcategories are removed from the analysis, the statistics for FLETC graduates match up very closely to those of all line of duty deaths in the United States. 39 of the 199 total deaths happened during non-emergency driving. The Driver and Marine Division teaches a course on non-emergency vehicle operations. Seven deaths occurred when the officer or agent was responding to a call, i.e., running code or during a pursuit. Of the deaths by gunfire, 10 occurred during the execution of traffic stops. The Driver and Marine Division teaches the Risk and High Risk Vehicle Stops course. Nine deaths were the result of the officer or agent being struck by a vehicle while on foot, either working a traffic stop and/or at a vehicle crash scene. Of the officers or agents listed in the “Other” category, three drowned after their boats capsized. The Driver and Marine Division teaches the Marine Law Enforcement Training Program which includes the Man Overboard and Survival Swimming courses. As a response to these research findings, the Driver and Marine Division staff is taking measures to mitigate future deaths in these areas through training. Of note is the recent use of driver simulators in which most of the scenarios involve non-emergency driving. During these exercises, the student must apply safe driving practices while utilizing in-car technologies when safe to do so, as well as apply appropriate judgment and decisions regarding other vehicles, pedestrians, and hazards on the roadway during various environmental and weather conditions. The Driver and Marine Division plans to evaluate a new modified Non-Emergency Vehicle Operations course laboratory and practical exercise in which there is more emphasis on all the requirements of an officer or agent operating a motor vehicle during non-emergency operations. Other FLETC training divisions will analyze the FLETC graduate line of duty death data related to their curriculums. Such evaluation will help identify training-related changes that FLETC might make to help reduce graduate line of duty deaths. The conclusions FLETC can draw from its current graduate line of duty death data are limited somewhat by the details available on each death. Additional information on these cases would be valuable to the federal training community. To that end, the FLETC Training Research Office is reaching out to FLETC partner organizations to supplement available data, and is exploring obtaining additional data regarding FLETC graduates’ line of duty deaths from the Federal Bureau of Investigation’s Law Enforcement Officers Killed and Assaulted annual reports. FLETC is committed to recognizing its partners’ fallen officers and agents and memorializing their sacrifices in protecting and serving our county. At the same time, FLETC is dedicated to learning from these deaths in order to help mitigate tragedies through training. Article reprinted with approval from FLETC. Then original article was printed in the Fall/Winter 2015 Edition of the FLETC Journal. The format was changed for Law Officer. MIKE ROBBS began his law enforcement career in 1980, serving with the Chattanooga Police Department for 11 ½ years. During this time he worked as a patrol officer, special weapons and tactics officer, special police operations team member, communications division supervisor, and instructor at the Chattanooga Police Academy. Employed at the FLETC since July 1991, Mike has instructed and/or managed in the Physical Techniques Division, Counterterrorism Division, Training Innovation Division, and the Driver and Marine Division. In May of 2015, he was assigned and is currently the law enforcement technology liaison for the Training Innovation Division’s Outreach and Exploration Branch, located in the FLETC Orlando, Florida, office. The extreme stress of being a law enforcement officer is a health risk. My husband is the manager of the law enforcement fleet repair and maintenance in Austin Texas. I have been there many times and met law enforcement officers. Strong, slightly distant, polite and FOCUSED! I can’t imagine having to be this way for an entire shift and then switching back into a more normal and interactive state. I have no answers to give, no advice to offer, only my condolences to you all for your fellow friend and prayers.